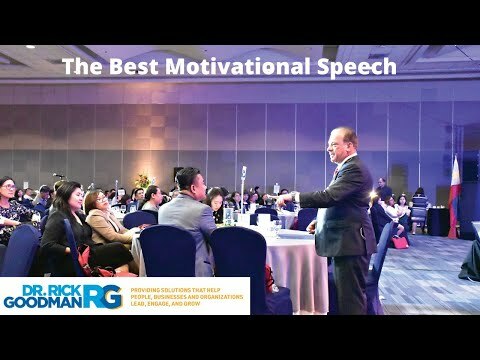 Dr Rick Goodman Keynote On Transformational Leadership at The Philippine HR Congress in 2018 Highlights. Dr Rick share how to be a solutions oriented leader and engage your team! A motivational keynote speaker and executive business coach, Dr. Rick Goodman is internationally recognized as a team building, leadership, and business growth expert. He is based in Florida, but delivers transformational leadership presentations throughout the United States and internationally. His mission is to provide solutions to people and organizations who want to lead, engage, and grow their business—helping them do their jobs more efficiently and effectively. In each team building training session or keynote address that he leads, Dr. Rick focuses on valuable information that leads directly to business growth. His expertise in team leadership skills make him a sought-after speaker and educator, and as such he has delivered speeches, presentations, and leadership solutions to clients such as the US Army, AT&T, Heineken, IBM, Hewlett Packard, Cavium Networks, American Cancer Society, American Red Cross, and Franklin Templeton Investments, among many others. Dr. Rick is also a published author, and co-wrote the book “Jamie’s Journey: Travels with My Dad,” which was featured on ABC, NBC, CBS, and “The Today Show”. And, as a certified speaking professional (CSP) from the National Speaker Association (NSA), he regularly provides confrontation management training, team leadership skills, and more. A lively, engaging, and data-backed approach makes him a top business speaker in Miami’s business community, and a leading motivational speaker throughout the State of Florida. He is also an accomplished international speaker. Global Speakers Share Insights on Rick Goodman Motivational Keynote Speaker Global Speakers Summit in Auckland New Zealand. Dr. Rick Goodman motivational keynote speaker recently delivered his keynote presentation Transform, Optimize Accelerate at the Global Speakers Summit in Auckland New Zealand to a Standing Ovation. Hers is what other global speaking experts are saying about international keynote speaker and author Dr. Rick Goodman. Hi, my name is Fredrik Haren from ProfessionalSpeaking.com and I've just seen Dr. Rick Goodman speak at the Global Speakers Summit in Auckland New Zealand. I have seen hundreds of speakers, no thousands of speakers and I have personally coached over 200 speakers and the difference between a good speaker and a great speaker is that a great speaker encompasses the message, you can feel it ooze out of the speaker it comes from a place of genuineness, authenticity and being genuine that's exactly what you get when you hear Dr. Rick Goodman speak. This is not a speaker, speaking from the brain, this is not a speaker speaking from his mouth, this is a speaker who is speaking from his heart. The heart that is big, authentic, raw and absolutely wonderful! And that is what his speech is I will remember it for a very long time! https://www.rickgoodman.com/ Hi, my name is Andrew Bryant and I’m a speaker, author and coach on the topic of leadership. I’ve been around this industry for 20 years I am very rarely surprised, and I have very high standard when I see another speaker. Last night I saw Dr. Rick Goodman close a day at an international speaking conference here in New Zealand and for American become the other side of the world and totally WOW an audience was not what I was expecting. Dr. Rick was engaging, he was funny he was informative he took us on a journey for 45 minutes and he transformed lives. 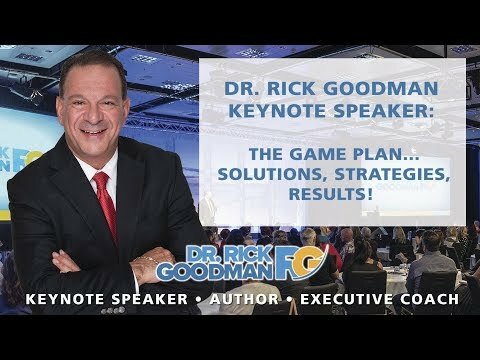 I highly recommend Dr. Rick Goodman for your next conference or convention. Hey, Elias Kanaris here from Auckland New Zealand at the Global Speakers Summit and I have just been with Rick Goodman. My goodness this man knows how to grab an audience he knows how to take a message to take you all the way up and get you back down low and then leave you with a massive high! It must be one of the best keynotes I have seen for a long time and boy if you want to talk about a leader to legacy this is a man with the message about legacy and how you and your voice can impact people for generations to come. A motivational keynote speaker and executive business coach, Dr. Rick Goodman is internationally recognized as a team building, leadership, and business growth expert. He is based in Florida, but delivers transformational leadership presentations throughout the United States and internationally. His mission is to provide solutions to people and organizations who want to lead, engage, and grow their business-helping them do their jobs more efficiently and effectively. In each team building training session or keynote address that he leads, Dr. Rick focuses on valuable information that leads directly to business growth. Dr. Rick Goodman regularly lectures at colleges and universities across the United States and his funny and content driven programs are a favorite amongst his audiences. His expertise in team leadership skills make him a sought-after speaker and educator, and as such he has delivered speeches, presentations, and leadership solutions to clients such as the US Army, AT&T, Boeing, Heineken, IBM, Hewlett Packard, Cavium Networks, American Cancer Society, American Red Cross, and Franklin Templeton Investments, among many others. Dr. Rick is also a published author, his book "Living A Championship Life A Game Plan for Success" received critical acclaim and he co-wrote the book "Jamie's Journey: Travels with My Dad," which was featured on ABC, NBC, CBS, and "The Today Show". And, as a certified speaking professional (CSP) from the National Speaker Association (NSA), he regularly provides confrontation management training, team leadership skills, and more. A lively, engaging, and data-backed approach makes him a top business speaker in Miami's business community, and a leading motivational speaker throughout the State of Florida. He is also an accomplished international speaker. Motivational Keynote Speaker Dr. Rick Goodman's motivational video filmed at the Interim Healthcare Franchise Annual meeting in Aventura Florida at the Turnberry Resort. The Power of One opening keynote speech delivered by Dr. Rick Goodman convention keynote speaker at the Interim Healthcare Franchise conference at the Turnberry Resort in Aventura Florida. A motivational keynote speaker, Dr. Rick Goodman is internationally recognized as a team building, leadership, and business growth expert. He is based in Florida, but delivers transformational leadership presentations throughout the United States and internationally. His mission is to provide solutions to people and organizations who want to lead, engage, and grow their business—helping them do their jobs more efficiently and effectively. In each team building training session or keynote address that he leads, Dr. Rick focuses on valuable information that leads directly to business growth. His expertise in team leadership skills make him a sought-after speaker and educator, and as such he has delivered speeches, presentations, and leadership solutions to clients such as the US Army, AT&T, Boeing, Heineken, IBM, Hewlett Packard, Cavium Networks, American Cancer Society, American Red Cross, and Franklin Templeton Investments, among many others. Dr. Rick is also a published author, and co-wrote the book “Jamie’s Journey: Travels with My Dad,” which was featured on ABC, NBC, CBS, and “The Today Show”. And, as a certified speaking professional (CSP) from the National Speaker Association (NSA), he regularly provides confrontation management training, team leadership skills, and more. A lively, engaging, and data-backed approach makes him a top business speaker in Miami’s business community, and a leading motivational speaker throughout the State of Florida. He is also an accomplished international speaker. Dr. Rick Goodman is a Healthcare motivational keynote speaker based in Florida State and known as a team building and transformational leadership expert in the United States of America & internationally. Dr. Rick Goodman has delivered speeches, presentations, and leadership solutions to clients such as the US Army, AT&T, Boeing, Heineken, IBM, Hewlett Packard, Cavium Networks, American Cancer Society, American Red Cross, and Franklin Templeton Investments - among others. Dr. Rick Goodman is a convention keynote speaker is a business growth expert at conventions in Orlando Florida. Dr. Rick Goodman co-authored the book “Jamie’s Journey: Travels With My Dad”, and was featured on ABC, NBC, CBS and “The Today Show”. Dr. Rick Goodman is a certified speaking professional (CSP) from the National Speaker Association (NSA). He provides solutions for people and organizations who want to lead, engage, and grow their business. Dr. Rick Goodman is a convention motivational speaker in Florida. Dr. Rick is a leadership keynote speaker for corporate conventions. Dr. Rick Goodman is a speaker, author, and serial entrepreneur who has delivered over 1,000 presentations to associations and corporations in the US and internationally sharing his systems on leadership engagement and sales increase. Dr. Rick Goodman Keynote Speaker: The Game Plan... Solutions, Strategies, Results!